On October 17, 2014, Rescue 274/926 was declared the champion of the first Rescue Marathon in the Philippines. 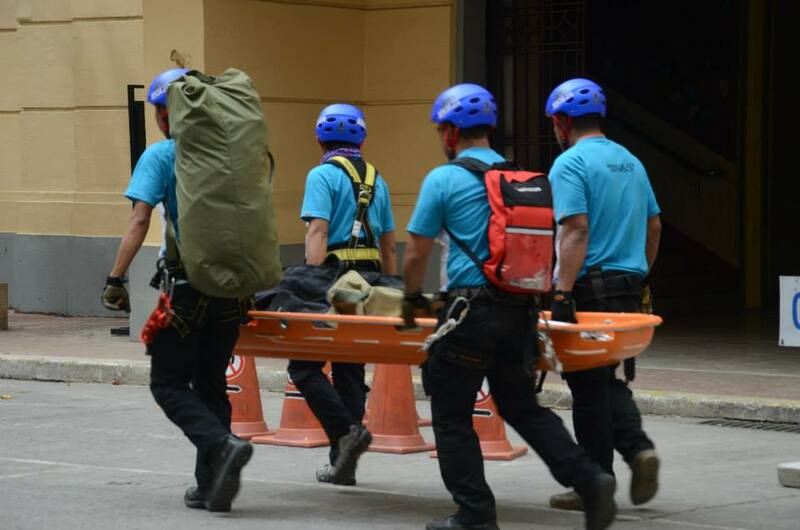 Organized by the City Government of Manila and led by the Manila Disaster Risk Reduction Management Office, the 3-day marathon held from October 10-12, 2014 tested the ability of the participating rescuers to respond to different forms of emergencies and disasters. More than 15 groups registered for the marathon—525th Engineering Combat Batallion (Philippine Army), Red Cross Manila Chapter, RAHA Volunteers, MMDA Road Emergency Group, Search And Rescue Unit Foundation, Quezon City DPOS, TRES, Tanay Mountaineers Search and Rescue, San Juan Rescue, and Valenzuela City Rescue, among others. It was a test of skills, time, speed, teamwork, strength, endurance, and quick-thinking. The pressure of the race tried and tested their bond and trust in each other. Even their personal relationships were put to test because the preparations demanded time, commitment and sacrifice. Had the outcome been different, the team believes that it was still worth their while. In the rescue world, training never really stops. They need to continually refresh their skills. “Mostly everything is perishable: accomplishing the patient care report, trauma management, even tying the basic square knot! One can also tend to forget a routine a s simple as talking to your patients in order to get the sample history,” said Fitz Borlongan, Rescue 926 senior volunteer. Preparedness is number one priority. Weeks before the marathon, Rescue 274/926 has been brushing up their skills on different areas of emergency response. Every weekend is training period. Most of the team members have regular day jobs. But as soon as they get off work every Friday, they head straight to training grounds. Rescue 274/926 training director David Tajan who also served as the marathon team leader, simulated emergency scenarios during training in anticipation of the different challenges. Training paid off. Rescue 274/926 was a composite team of 3 rescue groups—Rescue 926, Rescue 274 and COBRA Rescue. Rescue 926 is a non-profit organization of volunteers based in Makati, Rescue 274 is the emergency response team of Barangay San Isidro, Antipolo, Rizal while COBRA Rescue is a volunteer organization of riders and rescuers based in Antipolo, Rizal. Composed of 10 members, the team roster was finalized only a few days before the competition date. The composition of the team was strategically designed such that there will always be 4 of them who are strong in a particular area of rescue. It was an excellent combination of expertise. The team members were: David Tajan, Carlo Valenzuela, Efren Villafuerte, Arnold Leis, Gilda Mae Samson-Quides, Ian Lloyd Locsin, Jan Ralph Erson Domingo, Gerardo Samson, Fitzgerald Borlongan, and Roberto Jacinto. Armed with courage, quick-wits, technical skills, considerable experience, willpower, and esprit de corps, the team was a perfect blend for victory. The race was launched at Liwasang Bonifacio in the early morning of October 10, 2014. It was not a competition to beat each other but a race to save lives. Different stations were set up at Manila’s historical landmarks and tourist spots like the Manila Zoo, Rizal Park, Intramuros, Fort Santiago, Manila City Hall, and nearby old Churches. According to Mr. Johnny Yu, chief of the Manila Disaster Risk Reduction Management Office, in his closing remarks on October 12, the marathon was originally planned to be held in Corregidor but since the City of Manila is hosting it, the organizers thought it best to conduct it in their own city to exhibit the historical and symbolic sites of the country’s capital. True enough, the urban jungle was an amazing playground. Challenges include boat-handling, medical assessment, water rescue, vehicular extrication, rope rescue, land navigation, trauma management, and a mystery challenge, to name a few. Team member Ian Lloyd Locsin almost fell into the river when he slipped from the rope ladder at Jones Bridge. He arm-wrestled with the ladder to prevent his fall. The challenge was completed but he sustained a minor sprain in his left wrist. The multiple casualty incident challenge was also tricky. It included managing 24 patients with simulated trauma and other life threatening injuries, looters trying to run off with the rescuers’ equipment, and hysterical relatives who wanted to intervene with the responders. The team also climbed and rappelled down the famous Clock Tower of Manila City Hall, and rigged patients on a Basket stretcher. The 3rd day proved to be most challenging for them because of the sudden outpour late in the afternoon. The Clock Tower was slippery, the roads to the checkpoints were flooded, and they thought the odds were against them. The non-participating team members provided their all-out support during the 3-day marathon. Food was ready on the table as soon as they arrived at the base after every race. Water and ice packs were automatically handed to the participants. It helped ease the team’s weariness and motivated them further to finish the race. “We were very lucky we have a supportive group and allies. The rapid intervention team, headed by Charlotte Camantigue, was quick to adjust to the contingencies of the race, and we were well-taken care of by our logistics group,” Valenzuela said. Gilda Mae Samson-Quides, the only female member in the team roster, was thankful that her husband supported her decision to join the marathon even though training ate up too much family time. In fact, their wedding anniversary was on the eve of the marathon. Instead of celebrating with her family, she was already at the Makati headquarters gearing for the marathon launch. “I joined Rescue because I wanted to learn the skills needed to be able to help others, to help the community. I joined the marathon because I wanted to try and apply the skills I learned,” Quides shared.